The Cuban parliament has just passed an historic change to the island’s labor codes and have expanded the codes with language that explicitly protects the LGBT community and bans discrimination based on sexual orientation or gender identity, and received support from Christian and intellectual parliamentary leaders. riting before the vote took place blogger Camilo Garcia – better known as k1000g – wrote that, if passed, it would “be the first time in the history of Cuba when there is a bill explicitly protecting the rights –specifically at their working environment– of the people who have decided to live openly in contrast with heterosexual norms” (“On the eve of a significant step“). It also constitutes a valuable step, because it was the citizenship participation that brought this issue to the legislation. It happened without any public action, because –as expected– the national media did not say a word about it during the numerous press reports they have published in the last few months during this process… Something like this makes us think in two things: It may be a demonstration that the perception of the Cuban people about sexual orientation is changing, slightly for good, and that people have lost their fear to talk about it and to defend openly their rights openly. Then we are also talking about an important step against patriarchal power in Cuba… It will also be an action of historic fairness ¿How many people we know that haven’t had access to a job, or have left their profession, due to homophobic actions? ¿How many we know who has suffered in silence all their lives, or have taken more radical decisions –emigration or even suicide– as a result of homophobia? It is clear that this step brings more challenges. Among them, the necessary changes in regulations not to leave the new Working Code to fall on deaf ears. The subject of “gender identity” is still pending because –although people don’t understand it– trans people may not be homosexuals… and they still remain excluded from this piece of legislation. Besides, there’s still an urgent need of a wide and effective education campaign among the general population that addresses respect to sexual rights. In May 2013 the ILGA map recognized that 66 countries have adopted explicit protection rules over these peoples. 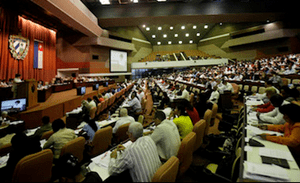 Cuba might be number 67 and keep taking new significant steps… because it is important to work out on policies that protect the rights of all people – and including sexual orientation as it was done at the 2012 Party Conference – but it is more important to make those commitments real by making them the law. Meanwhile the Employment Non-Discrimination Act (ENDA) which would protect America’s LGBT workers in one form or another hasn’t been able to be pass and be signed into law since 1974. How does this get reconciled in a place with zero personal liberties? This is part of the Castro propaganda machine! It is meaningless.